Six Simple Steps to help improve biodiversity on your land. Simply Sustainable Biodiversity is a booklet to help farmers monitor, manage and enhance biodiversity through the adoption of Integrated Farm Management (IFM). Based on Six Simple Steps, it outlines practical ways for farmers to manage their land for food production as well as for wildlife. 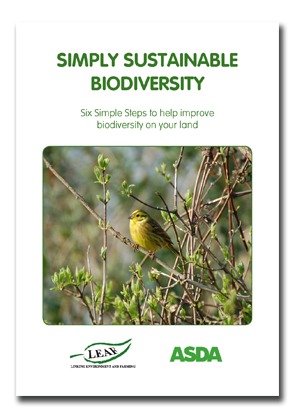 Simply Sustainable Biodiversity has been developed by LEAF in close association with ASDA. Download Simply Sustainable Biodiversity here.